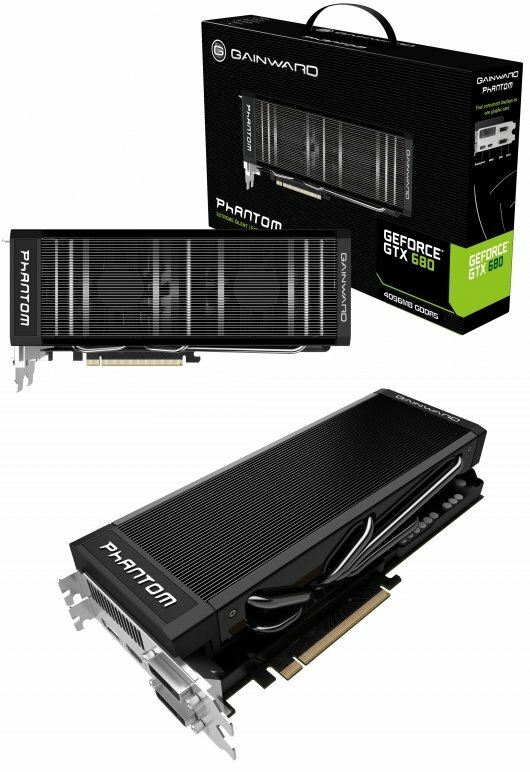 Gainward introduced a 4GB edition of its GeForce GTX 680 Phantom. The card uses the stock clockspeeds, it has a 1006MHz core, 1058MHz boost and 6008MHz memory. As the leading brand in enthusiastic graphics market, Gainward, introduces its Phantom series with 4GB on board memory for GeForce GTX 680 - Gainward GeForce GTX 680 Phantom 4GB. With great success of the Gainward GeForce GTX 680 Phantom and the Gainward GeForce GTX 580 Phantom 3GB, the Gainward GeForce GTX 680 Phantom 4GB brings the market the unlimited gaming gear. The most powerful GPU along with massive amount of on-board memory, powered by Gainward’s superior design and the Phantom II cooler, the Gainward GeForce GTX 680 Phantom 4GB is a “Dark Chilled Demon”. It is the first 4GB board base on NVIDIA Kepler architecture that you can buy from the shelves. The massive memory gives it far beyond the limitation of the memory when running the latest game titles. With the Phantom II cooler, it is almost the most silent air-cooled board in the market you can find. With this new design, Gainward GTX 680 Phantom 4GB delivers Extreme cool and silent acoustics under 3D heavy loading. It really is an extreme gaming gear for enthusiast gamers. Beside the cooler performance, Gainward GeForce GTX 680 Phantom 4GB is also powered by 6-phase with DrMOS PWM design for the GTX 680 cores. It brings a lot more benefits for the over-clocking capability. Gainward GeForce GTX 680 Phantom 4GB comes with 1058MHz boost clock and 3004MHz (or DDR6008MHz) memory clock, can be over-clocked easily. Thanks to 4GB on board memory, Gainward GeForce GTX 680 Phantom 4GB can reduce data transfers by keeping larger data sets in local memory to maximize performance. Especially for those games with multi-monitor configuration even for 3D VISION Surround system, the 4GB on board memory will provide unlimited energy for you to enjoy the lifelike gaming environment. Gainward’s new Expertool utility is a right tool for GTX 680’s dynamic clocking to tap into this powerful board. Users can utilize this new tool to enjoy the experience of the performance enhanced and quiet gameplay. The QuattroPorts supports up to four displays in the same time on a single GTX 680. Gainward GeForce GTX 680 Phantom 4GB also comes with a HDMI to DVI adapter for the users to enjoy NV Surround with three DVI monitors.